On Monday, December 3rd — swearing-in day for California’s new legislators — the Lifting Children Out Of Poverty Task Force held a press conference and public hearing at the Capitol to announce the release of its recommendations for ending deep child poverty in California. 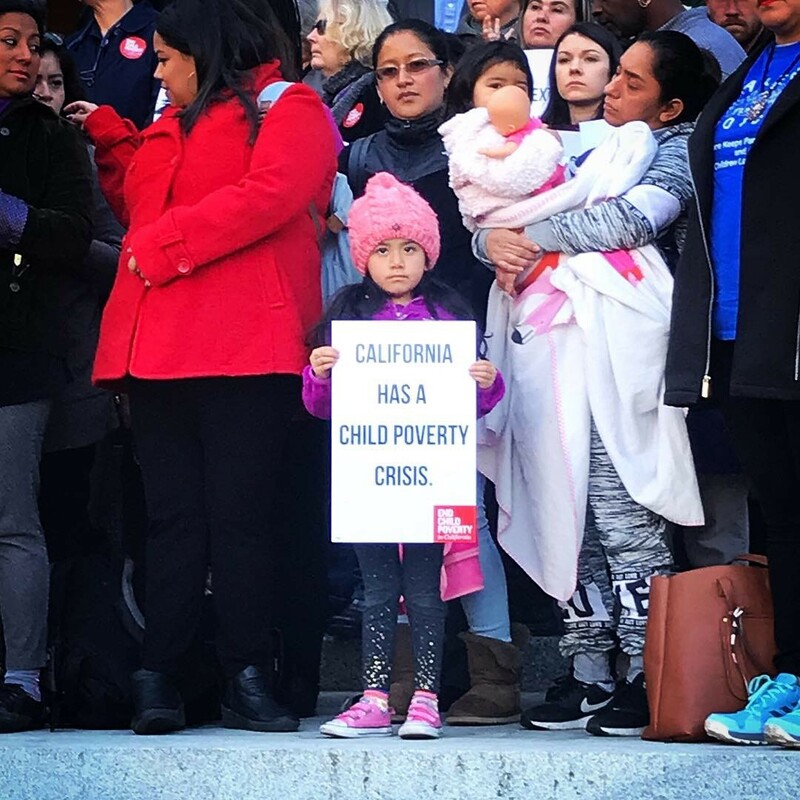 Western Center’s Jessica Bartholow, Chairperson of the Safetynet Committee of the task force, was joined by End Child Poverty CA, the California Poor People’s Campaign, and coalition members to call on the new legislature to address the critical issue. Elected officials in attendance included Assemblymember Autumn Burke — author of AB1520, which created the task force, Assemblymember Joaquin Arambula, Assemblymember Kevin McCarty, Assemblymember Laura Friedman, and Senator Scott Weiner. Priority recommendations from the task force include increasing CalWORKs grants to families with children, a child tax credit that would serve as a base-level income for families with children, and guaranteed child care for children ages 0-8 for low-income families. The full recommendations are available at the End Child Poverty in California website. Bartholow’s full statement from the press conference is below. To see photos and video from the event, visit Western Center’s Facebook and Instagram pages. California has the 5th largest economy in the world, and we have a budget surplus in the billions. Yet, in spite of that prosperity, we also have a childhood poverty crisis. Here in California, 450,000 children and their families live in deep poverty, and are unable to meet their basic human needs. When children live in deep poverty (defined as below half of the poverty line), they endure hardships that impair their ability to thrive,[i] impact their capacity to learn, and lead to increased hospitalizations and elevated death rates. Deep poverty harms a child’s brain development and early functioning, disrupting their ability to succeed in school and in life. [vii] These challenges have been documented to reduce the ability of children to cope during difficult situations — the very skill they need most as a child living in poverty, or as a young adult trying to escape it. Our state has a moral and practical obligation to provide a stronger foundation for the children growing up here, and to help their families move toward greater safety, achievement, and success. [x] For those reasons, and because I have experienced multiple indignities of childhood poverty myself, I was so very proud to serve as Chairperson of the Safetynet Committee of the Lifting Children Out Of Poverty Task Force. The Task Force plan lays out the steps necessary to end childhood poverty altogether, starting first with the urgent steps necessary to end childhood deep poverty. A budget that makes the investments necessary to end childhood deep poverty among CalWORKs recipient families. Last year, the legislature began to address deep poverty for the 60% of impoverished families who receive a CalWORKs grant. With a current average grant at just $556/month for a family of three, which is 33% of the federal poverty level (FPL), these families’ monthly incomes are much too low to support the healthy growth and development of our state’s children. [xi] Led by Senator Holly Mitchell, the Legislature passed the single largest investment in grants ever made, but CalWORKs will need three times that investment to end deep poverty for families in the program. A targeted child tax credit to be issued monthly to ensure that the 40% of poor families who do not receive CalWORKs are also given the ability to exit deep poverty. This tax credit, which acts like a guaranteed income for families with children, is not the robust guaranteed living wage income for all envisioned by Martin Luther King, Jr. in the first Poor People’s Campaign, but it represents an essential first step in that direction. The credit is targeted to impact Californians who need it the most and who have the most to benefit — our poorest families with children.